Option 1: Take a joint ferry bus service direct from Koh Phi Phi to Bangkok. Option 2: Take a ferry to Krabi and fly from Krabi International Airport to Bangkok. Option 3: Take a ferry and then a bus to Surat Thani and from there take a train to Bangkok. The cheapest option is to take a joint ferry and bus service from Koh Phi Phi to Bangkok. If you book cheap flight tickets from Krabi to Bangkok then travelling by air costs about the same amount as travelling by train, although you can book an inexpensive and fairly comfortable sleeper berth on trains from Surat Thani to Bangkok and save on the cost of a night in a hotel. Trains in Thailand are also fun. This ferry and bus service terminates in Bangkok near to the popular Khao San Road where you can find many cheap (and also not so cheap) places to stay. The ferry journey from Koh Phi Phi to Krabi takes around 1 hour 30 minutes. From Krabi the next section of the journey to Bangkok is by bus. Without breaks the driving time from krabi to Bangkok is slightly over 9 hours 30 minutes. Use the Search Box below to buy your tickets from Bangkok to Koh Phi Phi. For travel from Koh Phi Phi to Krabi Airport change the destination to ‘Krabi’. For flights from Krabi to Bangkok change the starting point to ‘Krabi Airport’ and the destination to ‘Don Mueang Airport’. For joint ferry and bus ticket to Surat Thani train station change the destination to ‘Suratthani Trainstation’. For train tickets from Surat Thani to Bangkok change the starting point to ‘Suratthani Trainstation’ and the destination to ‘Bangkok’. There are four direct services a day from Koh Phi Phi to Krabi Airport departing at 10.30 (2 departures), 15.00 and 15.30. All services depart from Ton Sai Pier and take 3 hours to reach to Krabi Airport. Tickets cost 650 THB for the 10.30 and 15.30 departures and 1,150 THB for the other 10.30 service and the 15.00 departure. From Krabi Airport there are over 16 daily flights to either Don Mueang Airport, which is the closest one to central Bangkok and the cheapest one to travel to, or to Suvarnabhumi Airport which is where most of the international flights depart from. This is a two part journey. The first part of the journey is a ferry and bus journey from Koh Phi Phi to Surat Thani Train Station. There are two daily departures from Ton Sai Pier (in Koh Phi Phi) to Surat Thani Train Station operated by Phantip Travel. These services depart at 08.15 and 13.00 and cost 700 THB per person. The journey time is 6 hours 15 minutes or 6 hours 30 minutes depending on which service you take. 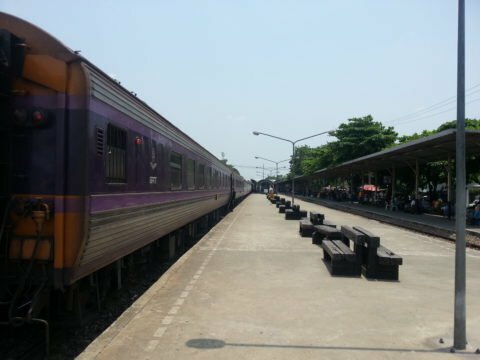 The next stage of the journey by train from Surat Thani to Bangkok is scheduled to take from 9 hours 5 minutes to 12 hours 46 minutes depending on which train you take. For more information about train travel see Thailand Train’s Guide to Train Travel from Surat Thani to Bangkok.